Leicester City manager Claude Puel says England defender Harry Maguire is not for sale despite reported interest from a number of top-six clubs. Manchester United, Manchester City and Tottenham have all been linked with the 25-year-old summer signing from Hull. But Puel says he wants to "build his team" around the centre-half, who made his England debut against Lithuania in October. "He is a valuable player for us. It is just speculation," said Puel. 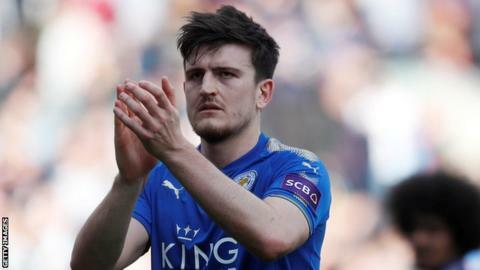 Maguire joined Leicester for £17m and has played every minute of the Foxes' Premier League campaign so far. He has won four England caps and is in contention for a place in Gareth Southgate's squad for the World Cup in Russia. "He came into Leicester and played and developed and he needs to continue to improve," said Puel. "He's a young player with fantastic attributes, an international player, and it is a good thing to have this player at Leicester. "He is an important player for us and it is important to give him a good feeling for the future, to build a good team around him and to keep a good ambition for the future." Asked if that meant he would not be selling Maguire, Puel replied: "Of course." The Frenchman says goalkeeper Kasper Schmeichel may miss Leicester's Premier League match against Southampton on Thursday after he picked up an ankle injury in the 2-1 defeat against Burnley on Saturday. "The problem is in his ankle and we will see if he can play," said Puel. "For the moment, he cannot train with us." Is Maguire the best signing of the summer? Read more on Leicester's Harry Maguire - is he the best signing of the summer?